Forays of a Finance Foodie: Bobby Van’s Grill Re-Visited: Can’t Get Enough Of The Juicy Stuff! Bobby Van’s Grill Re-Visited: Can’t Get Enough Of The Juicy Stuff! I’ve said it before on financefoodie.com: here is nothing quite as rib-sticking as a classic steakhouse meal, and Bobby Van's Grill on 50th Street in Manhattan does the "steak and potatoes" thing with a wow factor. They keep their dishes pretty classic but they dazzle with special little touches that put a modern flair on their fare. Their entrees, salads, sides and desserts have simple names, but everything is made to the customer’s specs and portions are very large. Super-friendly and mega-efficient general manager Paul Modica has a background in meat, having worked at the famous Midtown Meat Market next to the Palm back in his teens, so he knows quality and exactly what the guests want. Did I fail to mention that he also paid his dues as a waiter at Ben Benson’s, another great New York steakhouse and was a manager at several other famous eateries over the years? This man knows his stuff but he won’t give up the name of BV’s meat purveyor (no doubt if every other restaurant manager knew about it, they’d be ordering from there, too)! 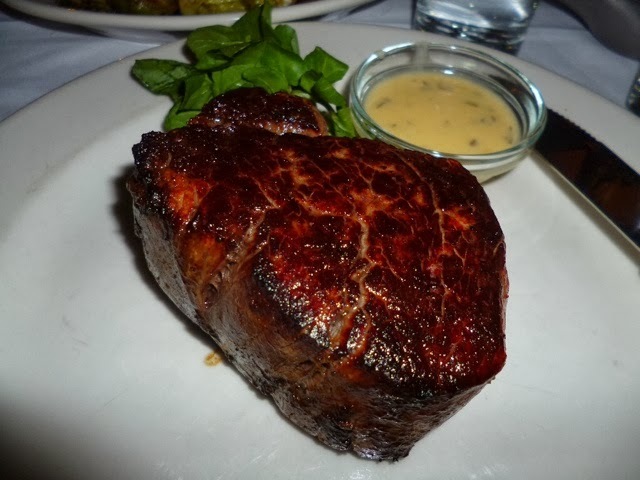 What I think of immediately upon entering the grand doors of Bobby Van’s Grill (and even when I am daydreaming at their computer) is their luscious filet mignon ($49.95), which weighs in at a staggering 16 to 18 ounces uncooked and is cut about three inches high. This is my fave filet in the city and I usually cannot finish it. If you love steak, put this item on your bucket list. It is well worth the money—and is even big enough to share or to take the leftovers home. But before digging into your luscious meat, don’t forget that Bobby Van’s has one of the most unique arrays of salads around. 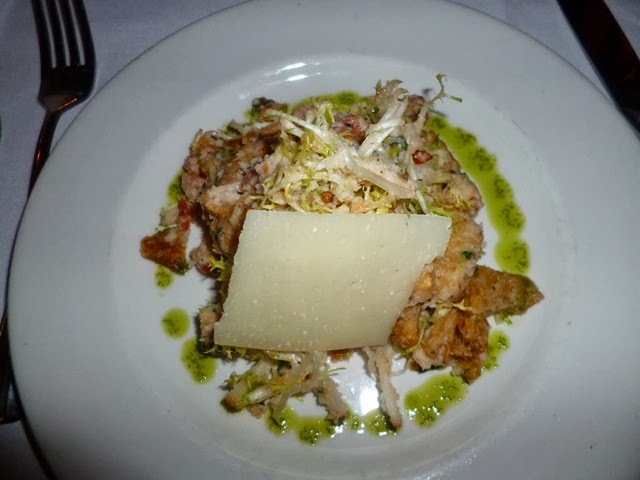 Their Warm Crispy Artichokes & Fresh Greens ($15.95) featured red pepper, toasted coriander and other delightful spices, and the artichokes are braised and topped with a big slice fine parmesan. I could have this salad for lunch and be super stuffed—the portion is about three or four cups in size. 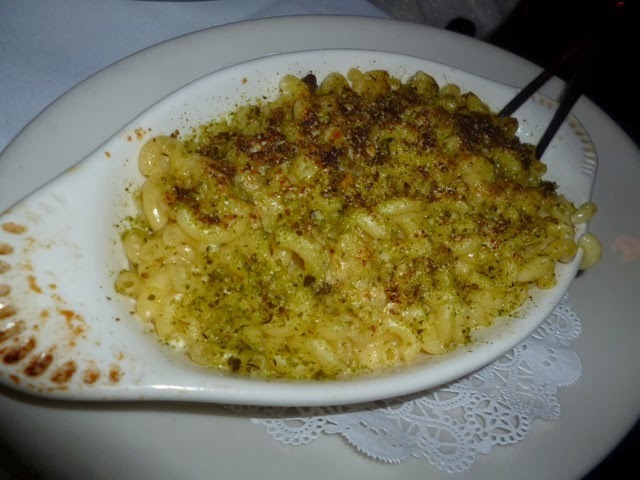 As our sides, my friend and I ordered both the Bobby Van’s legendary Mac And Cheese and Brussels Sprouts (both $11.95). The portions are about three cups, so two people can easily share one side. The Mac And Cheese is something dreams are made of—two white cheddars (English and American) and Parmesan are used in this including gooey, oozing delight. The sprouts are sautéed in rosemary, garlic and olive oil, then braised, and then cooked in an oven for a few minutes. They are divinely tender! 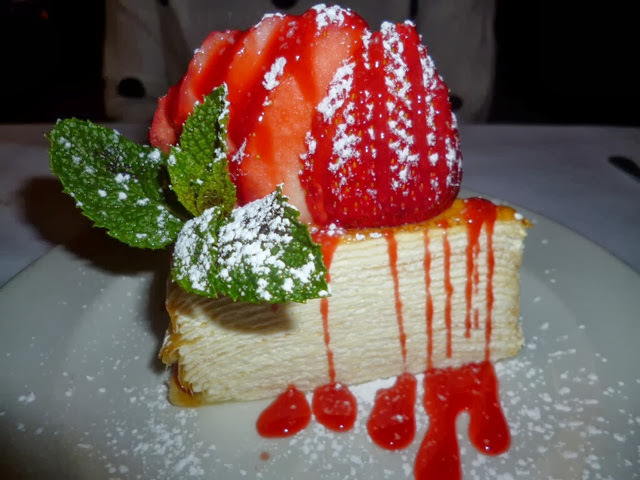 We concluded our meal with the 21 Layer Crepe Cake ($11.95), which is reminiscent of a very soft Napoleon without icing on the top. There are literally 21 layers of soft, very thin pastry filled with classic French custard—but this dessert id not overly sweet. I could not think of coming to Bobby Van’s and not concluding my meal without this divine delight! I love the way they take the time out to top it with a sprig of fresh peppermint, giant sweet strawberries and homemade raspberry coulis. I say run, don’t walk, to Bobby Van’s for a super-satisfying. rib sticking meal. It’s old-school New York brought up to date with flawless service. The staff is so accommodating if you need something customized to special dietary needs. BV’s has a great price fixe dinner for only $38 right now, and it might make for a great introduction to this grand dame of steak houses!